Walsall's goalless draw with Preston booked their place at Wembley for the first time in their 127-year history. Already 2-0 up from the first leg of the Johnstone's Paint Trophy northern area final at Deepdale, Dean Smith's men needed only to avoid defeat. But, on a tense evening, the Saddlers had to hang on in a frantic finale. Sylvan Ebanks-Blake hit the bar, home keeper Richard O'Donnell made four saves and Paul Downing cleared off the line. After getting down to his left to brilliantly keep out Paul Gallagher's fierce, low free-kick, O'Donnell then denied former Wolves striker Ebanks-Blake from close range, before making two reflex saves in the same scramble that ended with Downing making his goal-line clearance. After an almost totally incident-free first half, other than an underhit back pass which Tom Bradshaw stabbed just wide, Walsall twice went close within five minutes of the restart. Anthony Forde's shot was parried over by keeper Thorsten Stuckmann, who then saved again when Romaine Sawyers met Andy Taylor's low cross from close range. Full-back Taylor then fired over the bar before top scorer Bradshaw blazed a diving header too high. In a season's best attendance of 10,038 at Bescot, North End gave their loyal 907-strong following hope with a barnstorming finish - but it was too little, too late. And, marshalled by Downing, it was a mean, defensive display that booked Walsall a place at Wembley on 22 March against the winners of Thursday's southern area final between Bristol City - who hold a 4-2 first-leg advantage - and Gillingham. 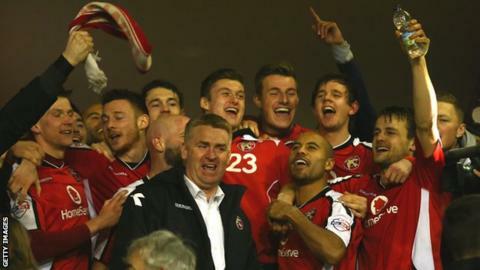 Walsall have previously got to within one step of Wembley four times in their history. In 1984, they lost 4-2 on aggregate to Liverpool in the League Cup semi-final, having held the Reds 2-2 at Anfield in the first leg. In 1993, they lost 9-3 on aggregate to Crewe Alexandra in the Division Four play-off semi-finals, losing the first leg 5-1 at Gresty Road. In 1998, they lost 4-3 on aggregate to Bournemouth in the Football League Trophy southern area final, winning the second leg 3-2 at Dean Court. In 1999, they lost 2-1 to Millwall in the Football League Trophy southern area final, losing the first leg 1-0 to an early Tim Cahill goal at The Den. Also, in 2001, they did reach the League One play-off final but, with Wembley under reconstruction, their 3-2 win over Reading was held at Cardiff's Millennium Stadium. "It's an amazing achievement to be the first Walsall manager in 127 years to take his team to Wembley, especially when I think of the calibre of some of the mangers who have been here before me and I feel very proud. "It was a very scrappy game, but then I always thought it would be and it turned out that the two-goal cushion we got up there was enough. "It was like pinball at the end, but the whole team dug in and we deserved it as we defended superbly. "Paul Downing turned into a man tonight, up against a really experienced player like Kevin Davies." "We haven't lost the tie tonight. We really lost it in that mad 10 minutes at Deepdale. "As the game wore on it opened up, we've got into some good opportunities, the keeper's made some good saves, we've hit the bar and they've made blocks. "We've not had the extra little bit of quality when it really mattered in the 18-yard box and just outside it to overturn the deficit. "We just have to stick together. We've got 20 games still to achieve our target of what we started in pre-season." Seven goals, last-minute VAR drama - was Man City v Spurs the greatest Champions League game ever? Read more on Seven goals, last-minute VAR drama - was Man City v Spurs the greatest Champions League game ever?